Heck, I do too. I have major envy for similar service-based boss-ladies who are killing it on social in half the time. 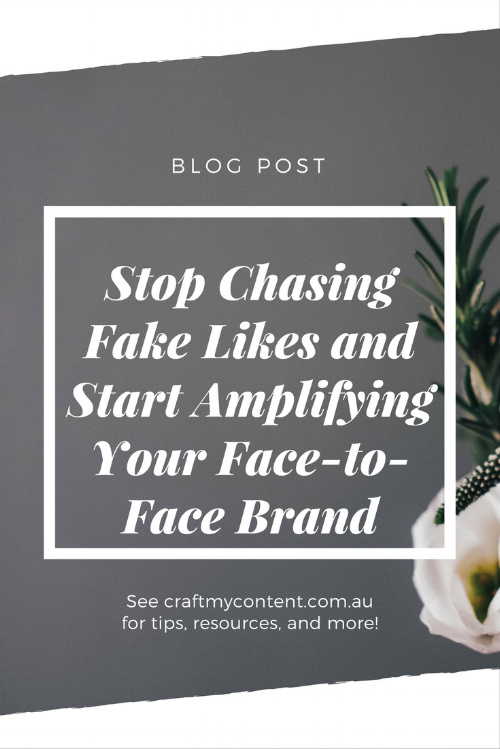 But when you think about what’s involved with all this chasing – ruthless marketing, competitions and giveaways, sponsored posts, daily content creation x 5 – I’ll bet only half that mega audience you’re accruing is actually relevant to your business. Worth your time. Likely to lead you to a sale. If you're relatively new to this business she-bang, you'll find more value from networking. Newsflash! People need to feel they trust you before they’ll buy from you. And, they need around 10 touch points before they’ll engage with you. But, with your ambition to be the most liked service provider in [insert location here], you’re forgetting about the likes and follows you already have. Actual people whom, IRL, have worked with you, learned with you, danced with you. Former colleagues and clients, industry contacts, your friends! These are people who know you well enough they’d vouch for you – but, I’ll bet you neglect reaching out to connect, catch up, and maintain those relationships. I don’t mean to maintain only with a sale in mind. But, be genuinely present and helpful and not expect anything in return. While we’re on it - put down your phone and start attending events; Invite your LinkedIn contacts out for coffee. Honestly, we’re the most disconnected connected society to ever exist! Make it your personal target to attend 6 events in 2018 (that’s only 1 every 2 months – totally achievable). Introverts – that’s you too. Find an ‘introverts meet up’ and be awkward together. Why? Because we trust an authentic face-to-face interaction faster than any online communication. The proof? All but one of my clients resulted from an existing relationship of sorts. They were real world contacts – and didn’t know me from my hashtag strategy. If you have a serious case of denials, please, kick back and relax. I’m not saying don’t create any content at all! You can document your real-world interactions, share your experiences, and demonstrate your personal business touch every time you meet, greet, and coffee – you’ll be creating genuine, purposeful, 'social proof' content for your feeds while also building genuine relationships and sales leads. As fun (or stressful) as it might be staging and posting your pretty pictures – when it’s crunch time – your stylish insta grid isn’t going to land you sales. Your obsessive creating habits pushing stuff out for the sake of it is taking you away from genuine opportunities to get up close and personal with people who actually want to buy from you. Stop hiding behind the ‘hustle’ and network! Find an awesome group of like-minded boss-ladies – and start building your IRL brand. If you’re in Brisbane and you think I’d be an awesome chick to share a coffee with – hit me up (because, I am). Newer PostAre You Creating Killer or Filler Content?